I have been an author since the age of fourteen and write dream-sagas that incorporate a variety of different genres, including historical fiction, suspense, thrillers with a supernatural twist, and epic/dark fantasy. I am also a classically trained soprano/violinist/pianist and have been performing since the age of three. Additionally, I hold a BA in Management and an MBA in Marketing. If I had not decided to become a writer, I would have become a marine biologist, but after countless years spent watching Shark Week, I realized I am very attached to my arms and legs and would rather write sharks into my stories than get up close and personal with those toothy wonders. Today, I’m sharing with you the most intensely personal interview I have ever done. When I was first sent these questions, I never thought answering them would help me make peace with feelings I’d been unconsciously suppressing for many years, but I am so thankful that this was the case. I’ve learned a lot about myself over the last few days because of this, days that have been painful yet necessary for me to heal in many areas of my life and find joy again where before there was nothing but sadness and confusion. And speaking of joy…this interview has given me, truly, for the very first time, a venue to share my feelings with you all about the amazing man, my beloved soulmate, who has changed my life in so many glorious and magnificent ways since we’ve been together. I hope you enjoy not only reading about him, but also about a few important books that have touched my heart, some of my inspirations, including one legendary panther, and many other things, both serious and silly! Additionally, Jean is hosting a giveaway of not only Deadmarsh Fey, but also my supernatural thriller, Corcitura. You can enter for a chance to win a Kindle copy of each novel by clicking here. What was the single worst distraction that kept you from writing this book? It wasn’t a distraction, but taking a wrong storytelling direction kept me from writing Deadmarsh Fey for an entire year. 2013 was spent working on what would become the fourth book in Dwellers of Darkness, Children of Light (the series Deadmarsh Fey launched), only I didn’t know this at the time, which was why writing this book out of sequence felt very wrong, not to mention terribly frustrating. There were things happening in this novel that I had no explanation for, and an untold history of how this world my characters found themselves imprisoned in had come to be. When my mind cleared enough for me to be able to envision the trajectory Dwellers of Darkness, Children of Light, needed to take, I realized that these stories—begun as prequels to a fantasy series I’d started writing in 2003, a series in which some characters from Deadmarsh Fey were my main adult protagonists—had taken on lives of their own, and were now demanding to be told, and unless I gave in, I’d never be able to understand what had affected the characters in those original books so strongly when they were children, and molded them into the adults they became. And then the Dark Wreaker burst onto the scene, with a horde of devils in his wake, and changed everything. Even though the experience I underwent in 2013 was incredibly frustrating, I do not regret the time I spent working on that fourth book. What was written in it (and the novel is fully written, though it will alter dramatically when all is said and done) laid the foundation for nearly every myth and legend—even inspiring a number of significant events in Deadmarsh Fey—that I would have never known how to interweave throughout the series if I hadn’t written that fourth book first. Has reading a book ever changed your life? Which one and why, if yes? Yes, Crime and Punishment, when I was seventeen. I had always enjoyed reading, but it wasn’t till I lost myself in this masterpiece that it truly became a passion—and opened up avenues I never would have considered traveling down, nor had the courage to do so, till I made the acquaintance of this book. The masterful way Dostoyevsky painted with words astounded me. I was absorbed by the rich psychological portraits he was able to delineate with a few strokes of the pen, and all the force of his imagination. Since then, only this year, in fact, thanks to my beloved, I have been exposed to other writers who remind me of him, most notably Knut Hamsun and, very recently, Ivan Turgenev, both of whom have that same lyrical touch, an equal genius for capturing the essence of a human soul and sketching it into life upon the page. Though the canvasses they painted their visions upon are much smaller, their portraits are no less penetrating and brilliant. And yet, while Crime and Punishment was over 700 pages, I remember wishing it had been longer, and I missed the characters, even Raskolnikov—whom I had intense sympathy for, which just shows how adept at evoking pathos and emotion Dostoyevsky was, getting me to feel compassion for a man who had done such terrible things—when my time with them in 19th century Russia was over. Much like my experience reading David Copperfield five years before, it was as though I’d lived alongside these characters, suffered with them, endured their trials, even felt the panic of the net closing in around one character in particular… My emotions ran the gamut; I was inspired, exhausted yet exhilarated, and found myself with an insatiable longing to create that only writing could fulfill. I don’t believe in coincidences, and know it was no accident I read this book on the heels of a paradigm-shifting moment in my life—and that it proved to be the final push in the right direction I needed. In my heart, in that moment, I knew what I was being asked to decide. And so I made my choice—never looked back. Tell us your most rewarding experience since being published. Writing a book is an intense, often quite solitary, endeavor. While you are lost in the creation of it, and especially when the work is done, you can’t help wondering, with a mix of hope and dread, if anyone will love the book as much as you do. Yet once the story has been released into the world, it ceases to be yours alone, and you must, however wrenching it might be, let the characters—and this tale you’ve poured your being into—fend for themselves. As the poet Paul Celan once said, “a poem, as a manifestation of language and thus essentially dialogue, can be a message in a bottle, sent out in the—not always greatly hopeful—belief that somewhere and sometime it could wash up on land, on heartland perhaps. Poems in this sense, too, are under way: they are making toward something.” Should this not be what every writer, whether of poetry or novels, strives for? This concept of the “heartland” affected me deeply when my beloved shared it with me a few months ago, because Celan’s words crystalized what I’d always felt. With each book I have written, but most passionately regarding Deadmarsh Fey, my goal, my wish, has been that my characters, and these realms they populate, would resonate with readers and move them in meaningful ways, hopefully changing them for the better, and making them think differently about their inner lives and the world around them. And that is why my most rewarding experience since being published has been how people have reacted to Deadmarsh Fey. From these reviews, it is obvious that many readers have understood the book, “gotten” it, as it were, and let themselves be seized by my story. And, what’s more, are incredibly excited to discover what happens next in this saga known as Dwellers of Darkness, Children of Light. All this fills me with joy, because it shows that my message in a bottle, for these readers, at least, has washed up on the shores of their hearts and struck a chord within their souls that I hope will reverberate for many long years to come. In your new book, DEADMARSH FEY, can you tell my Book Nerd community a little about it and why they should read your novel? Every novel in Dwellers of Darkness, Children of Light is told in a different voice, written from the perspective of a new protagonist through whose eyes we see the story. In Deadmarsh Fey, the eyes belong to Roger Knightley, ten years old and cousin to Havelock (Lockie), the Deadmarsh heir. Roger is a firecracker, and though but a child, is a well-read one (reared on the mystical and often blood-soaked legends from both sides of his lineage, Welsh and English), which has resulted in his having an extremely vivid imagination. Sometimes, this can be problematic, but it means that Roger hasn’t yet been poisoned against the fantastical, or robbed of his sense of wonder. Since he has no trouble accepting the inexplicable at face value, he is quicker to understand and recognize the dangers the creatures tearing out of the Otherworld and into our own pose to himself and his family than the adults—and those who supposedly have all the answers—surrounding him. He also has a wry bent to his personality, and a stubborn streak, that help and hinder him in various ways as the book progresses. And he’s obsessed with dragons. You’ll have to read the novel to discover if this proves fatal to him, and others, or not. Regarding the heart of the story, the events in Deadmarsh Fey, though cloaked in the garb of fantasy, are truly about fighting for those you love, and all you hold dear. This is the supreme driving force behind Roger’s actions and those of his friends and allies. It’s not just about survival, or stopping the Dark Wreaker—a nebulous entity who has bedeviled the Deadmarshes for seven hundred years—and his army of Jagged Ones and blood-tied horrors, both fair and foul, from being unleashed upon this earth, but about saving the very souls of those who are most important to you, those you’d sacrifice everything for. And that is something that has appealed to me far longer than I can remember, not only in storyweaving, but in life. Also, whether we are aware of it or not, each of us has a fundamental longing for “home.” By that, I don’t mean a dwelling, but a deep ache in the heart to find the place we truly belong. When it comes to my writing, my “home” has always been in these Otherworlds I have created—perilous realms infected by a darkness hell-bent on destruction…yet these realms are not hopelessly desolate, but seared with beauty and light, peopled by characters who heed the call to lay everything on the line for a chance(sometimes infinitesimal) to defeat the evil that threatens to annihilate everything they love, for they have realized that their world, though fallen—and not so dissimilar to our own—is worth fighting for. When reading my books, especially Deadmarsh Fey, I hope you lose yourself in these worlds, that you let go and journey along with the characters, grow attached to them, possibly even become them if only for a brief while—seeing in them a reflection of yourself. And if by doing so you discover what your “home” is, then that is reward enough, for it will mean I have made the best use of the time that was given to me. What was the most surprising thing you learned in creating your characters? That I had to trust them enough to let them have free reign. They knew better than I did where to take the story…because it was theirs, and they were living it. All my characters were extremely vivid in my imagination when I began writing the book (save for one or two who materialized out of nowhere mid-novel and drastically changed the course of events), but Kip, and especially Carver, presented themselves to me almost fully formed. I didn’t have to do much of anything with those two, besides let them take center stage and steal whatever scene they were in, which Kip did with dignity and gravitas that would have made the ancestral fylgja, guardian spirit of his family, proud—and Carver did with enough demonic savoir faire to make the devil himself turn green with envy. I know many people might find it hard to believe, or even slightly crazy, that characters an author creates can became separate flesh and blood entities from his/her imagination, but at a certain point, my characters did, demanded to be let off the lead, and I had no choice but to comply. Trying to maneuver events in an inorganic way, forcing things to go in the direction I thought was best, rather than what the story and characters were calling for, would have stalled the book and turned it into something completely different, and much less cohesive—not to mention deadly dull. To a much, much lesser degree, the characters in my last novel, Corcitura, asserted themselves, too, but never had this happened with such immediacy as it did in Deadmarsh Fey, to the point where I feel that I was just the facilitator for this book. Roger and Company were the real storyweavers, and once I realized this, I passed the tiller into their hands, and let them steer the ship where they willed. Why do you feel you had to tell this story? There was no way I couldn’t tell this story. Once I made the decision to write Deadmarsh Fey, once my year of confusion had come to an end and I determined the course this saga would take, I was seized. There’s no other way to describe the intensity of emotion that came over me. Not long afterward, once the characters had nudged me out of the way, the book began, essentially, writing itself. I love my first two novels, I always will, but there is something different about Deadmarsh Fey, something unique, that I didn’t experience when writing these earlier books. With this novel, I discovered what I was meant to write—fantasy, or rather, dream-sagas, as my beloved has christened them. There is a quote by J. R. R. Tolkien, who has been a defining force and inspiration not only on my writing, but also in my life, that struck me when I first heard it more than a decade ago, because I agree with him completely: “Fantasy is escapist, and that is its glory.” I’ve always understood him to mean that fantasy writers craft what we do not to escape our world, but to understand it. By losing myself in my invented universes, worlds that mirror our own in strange and startling and often unsettlingly familiar ways, I feel I have found where I truly belong, finally fulfilling the gnomic wisdom Gandalf spoke to Frodo, and, unknowingly, to me, those several years ago. What was the most magical thing that happened while creating Roger? This was an especially hard question for me to answer, and intensely personal. I started out with one response, which I still think is partially valid, but a few days ago, it came to me—quite suddenly, shockingly, and with no small degree of heartache—that Roger and I had a much deeper bond than I’d realized until something of a personal nature happened to me this week that brought painfully intense emotions I’d been unknowingly suppressing rushing to the surface. It wasn’t a pretty picture when this happened, but it was necessary, and cathartic, and gave me tremendous clarity about this character and what he really means to me—and revealed why I had always felt so much love, tenderness, and compassion toward Roger when I was creating him, and do till this day. To begin with, I originally believed the most magical thing that had happened when I wrote Roger into being was that I became him in so many ways. It was a natural thing to have occurred—and I’m sure many authors feel the same way about their creations—since Roger was my main protagonist. But he always, strangely, felt more like my own flesh and blood than any other character I’d ever created before, and it wasn’t only because Deadmarsh Fey is told in third person, restricted, which means I, perforce, had to see everything through Roger’s eyes—all that was glorious and nightmarish, good and evil, one more often than not masquerading as the other and making it nearly impossible to distinguish friend from foe. Yes, I had to put myself into the shoes of this ten year old English child who was obsessed with dragons. Yes, I had to imagine what his reactions to things literally out of this world would be. And yes, most imperative of all, I had to know him better than I knew myself, and needed to do so in order to make him live and breathe on the page and be real not only to me, but to anyone who ever chose to read his story and journey by his side into the perilous realm he called home. But it wasn’t until very recently that I realized, with the force of a punch to my heart, just why Roger had always been so dear to me. Without delving into too much detail, for over a decade, I endured a very desolate period of misdiagnoses and wrong information regarding a health issue that has a chance to be fully resolved in the coming weeks, and was told throughout these preceding years that many things I had always dreamed of, many joyous events most women, I imagine, would want to happen in their lives, would not be possible for me to experience. During this extended dark night of the soul, my books became a lifeline, an outlet into which I could pour my heart and being, and never more did I do this than with Deadmarsh Fey…because of Roger, even if the full realization of why wasn’t brought home to me till seventy two hours ago when I finally understood the reason it felt so right for me to have always thought of him as my flesh and blood, although I never phrased it like that to myself till then, nor had I been aware that any name needed to be given to the feelings unconsciously caged within my heart. After an intense few days of soul-searching, anguish, and tears—lots of tears—I finally understand why Roger is so precious to me, and why I feel so close to him, even still. In him, I saw the son I hoped to have one day, and believed I never would be able to. Revealing this to my beloved (who was with me when the dam holding back my suppressed emotions broke), reflecting upon it, and discussing how it had affected me without my knowledge, until the events of this week triggered clarity of mind, touched him deeply and opened up a way of thinking that made immediate and incredible sense to me, and allowed me to realize that I can now let Roger go. Watching this literary child of mine mature and grow in successive books will be vital for me—and part of the healing process, I suspect—but I understand, now, that while I will always love Roger, and he will forever be in my heart, my love doesn’t have to be confined to just my literary son. One day, it can be given to the real child whose very existence need no longer be a nebulous and unattainable dream. If you could introduce one of your characters to any character from another book, who would it be and why? I considered having Roger meet Smaug, but quickly came to my senses. Tolkien’s beast isn’t exactly the nicest of souls (Need I bring up the whole “I am Fire! I am Death!” thing? ), and having a dragon-mad child obsessed with conscripting a fire-breather, any fire-breather he could get his hands on, into one insane scheme after another—a child determined not to take no for an answer—would have resulted in Roger being torched into a little pile of ash in two seconds flat. Then I contemplated initiating a meeting between Roger and Puddleglum from C. S. Lewis’s The Silver Chair (my third favorite Narnia book after The Lion, the Witch and the Wardrobe and The Magician’s Nephew), but Roger would have gotten fed up with the marsh-wiggles’s doldrummy woe-is-me-ness after about 6.9 minutes. In the end, I settled on Bagheera of Jungle Book fame, who just so happens to have earned a passing, and incredibly sarcastic, mention from Master Coffyn in Chapter 19 of Deadmarsh Fey. I’ve been fond of Bagheera for most of my life, ever since I first saw the animated Jungle Book when I was a very young child. He’s just so lordly and majestic, wise and, let’s be honest, awesome. Another reason for my admiration is that I love cats, especially black ones, but because I’m slightly allergic to them, I have had to express my affection for these beautiful creatures from a distance by putting them into my novels, hence the reason Kip plays such a huge and pivotal role in Deadmarsh Fey. And that brings me to why I’d want Roger and Bagheera to meet. Kip definitely has his own distinct personality—he presented himself to me almost fully formed, as I mentioned above, after all—but while I had many inspirations for my cat, this panther was a defining influence on him. Roger and Kip share a tremendous bond—a bond initiated before the events in Deadmarsh Fey take place and solidified as the story progresses—and Roger having a chance to get acquainted with a character I consider to be Kip’s literary older brother would be a visceral reinforcement of what the boy already knows, that even though Kip is, as Roger thinks at one point, a “compact little animal,” the cat, like Bagheera, has a panther’s heart, strong and fierce and fearless, and would never back down from defending those he loves when they are threatened, be it by a Jagged One or Shere Khan, it matters not. And here’s something that didn’t occur to me until this very moment…Mowgli and Roger are the same age, and, though endearing, are each quite a handful—not to mention that there are forces at work that would love nothing more than to see both boys dead—so if Kip went along to this meeting, ye gods would he and Bagheera have loads to commiserate about! What are some of your current and future projects that you can share with us? My current project is the sequel to Deadmarsh Fey—set seven years later—and the second novel in Dwellers of Darkness, Children of Light. Several times in Deadmarsh Fey, I mentioned the Vickers family, particularly Isobel, the youngest daughter, who is Roger’s contemporary and good friend. Near the end of the novel, Isobel’s and her family’s link to the Deadmarshes, and the beings hunting them, is hinted at, and, to a certain extent, revealed to Roger in a shocking way. What he discovers leads directly into book two, Isobel’s story, which takes place on a desolate rock called Cutwater Island. Here there be sharks, and demons of the deep. And a creature whose memory is as fathomless as its desire for revenge. Once the sequel to Deadmarsh Fey has been completed, I will be working on the next two novels in Dwellers of Darkness, Children of Light. All the books already have titles, but these are rather sensitive, so I’m holding them in reserve till I announce the publication of each novel. Have you ever been really freaked out by something on the internet? If so, what? After we’d reached marginal utility in the flying saucer department, this video suddenly—and very sinisterly, in hindsight—materialized on the suggested videos sidebar. It was called, “Top 10 Most Shocking and Unexplainable Happenings Ever to Be Caught on Camera!” or some other such bombastic, and impossible-to-resist, title. By that point, feeling a little disappointed that the UFO videos had failed to scar us for life, we were game for anything, and also kind of high on ourselves, I have to admit, for apparently having such nerves of steel. It wouldn’t be a stretch to say that our attitude toward the supernatural in that moment could be boiled down to, “Us? Us? Get scared by that? HA!” and so we (stupidly) clicked on this new devilry, to use a turn of phrase coined by Boromir (And we all remember what happened to him…). If I came to your house and looked in your attic/closet/basement, what’s the one thing that would surprise me the most? Most horrifying dream you have ever had? A seven foot tall E.T. dressed as the Grim Reaper, emerging from my bathroom in the dead of night with murderous intent, scythe in hand. I was about five years old when I had this dream, and E.T. and I didn’t make peace until fairly recently. Now I’m quite fond of the freakish yet adorable little tree stump, but our relationship was a bit strained for several years, to say the least. Which incident in your life has totally changed the way you think today? Meeting my beloved has not only changed the way I think about everything—my past, my present, my future, my joys and sorrows, setbacks and triumphs—but has irrevocably changed my life, as well. Loving him, and receiving his love in return, has made me a fuller person—complete—and has led to me knowing myself better than I ever did before. I find it astonishing how in tune we are. Here’s just one of many examples I can share…we have the same crazy and unbelievably random (And I mean RANDOM! I’m thinking of one in particular right now that knocked us both flat by proving just what a couple of complete born-to-be-together weirdoes we truly are) thoughts, and blurt them out at the exact same moment! I have lost count of how often this has happened, but it’s pretty much a daily occurrence, and has been for quite some time. Being in tune in so many ways has been a hallmark of our relationship since our earliest days. Our very first conversation had sparks shooting off between us when we both revealed a mutual love for the Eddas, everything Germanic and Saga-inspired…and I confessed to him my obsession with JAWS and sharks in general—and he didn’t flinch! He’s exposed me to so many wonderful things, some of my favorites being music—he has fantastic taste—and philosophers, the one impacting me the most to date being Henry Corbin, whose ideas matched up so perfectly with concepts I had been mulling over for thirteen years but never had a name for till my beloved shared this luminous thinker with me. Our oneness of spirit has grown deeper with each passing hour as we’ve shared our lives with each other—all the important things and the silliest ones, too, and been there for each other in the best and worst of times—and we’ve continuously discovered, more and more every day, how beautifully and miraculously our souls, and thoughts, chime in harmony. And it’s uncanny how he knows exactly what articles to send me, because no matter what they’re about (from the sagas to politics, and everything in between), I devour them and find myself forever exclaiming, “Yes! Yes, that’s what I was thinking! This is what I have always believed!” and tapping into a wellspring of inspiration that has long lain dormant, till he shares with me something he knew I’d love, knew would be the spark needed to kindle my thoughts and ignite them into being. This happened just last week, and because of what I read in the essay my beloved sent me, because the thoughts of the writer echoed in my soul and literally roused the Bear hibernating there, a story arc which I’d been struggling with for over a year found resolution, came full circle, and changed the course of one of the books in Dwellers of Darkness, Children of Light entirely. Another thing I find absolutely wondrous is how he’s opened my mind to so many things I was very closed off to before, very biased against, in fact, and made me view the world, especially history, differently. Yet he’s also reinforced beliefs I already held, making them stronger and richer and more defined in my heart and soul. He encourages me and I him to become the people he and I were put on this earth to be, which I think is a rare and beautiful aspect of our relationship, and something we are blessed to share. And even in areas where our beliefs diverge—religion, for example, which has never been an issue for us—we still have commonality, because we both have an appreciation and respect for the Divine, and see it at work in our lives. We enrich each other—never tearing down, always building up, for we realize how precious a gift love is, and are very grateful to have found one another at long last. We’re passionate advocates of each other’s writing, too. His background is philosophy, and I am not being biased when I say he’s brilliant, and not just in this field, but in many other areas, as well. Just don’t get him going on Richard III or he’ll recite the entire Shakespearean tragedy from the beginning! My little playful ribbing aside, every time we speak, each moment we’re together, I am continually inspired in every way, and I cannot even begin to tell you how having his unconditional support and love across all areas of my life has changed it, and me, so profoundly. I’m amazed anew every day by all of this—amazed anew each day by him—and am incredibly, eternally, grateful to have him in my life, to have been blessed with such a glorious soulmate, whom I love with all my heart. He truly is the greatest gift God could have ever given to me. This selection of quotes will appear in a very personal interview on Friday, featured at Jean the Book Nerd’s great site, but as that interview is quite extensive, I thought it would be a good idea to share them with you today in a separate post. I hope you enjoy this little glimpse into Deadmarsh Fey. “Tell a man your name and he will have power over you forever,” Carver muttered. “Because I am the monster lurking in the shadows,” Incendiu snarled. “But that happened in a wilder age, a less enlightened time,” Roger argued. “There are more things in Heaven and earth…” Uncle Gryffyn muttered. “Now ain’t the time to be quotin’ old Bill Shakes, guv,” Bellows shot in. Deadmarsh. The name struck terror into the hearts of all who heard it. But to Roger Knightley, neither Deadmarsh the house, nor Deadmarsh the family, had ever been anything to fear. Nearly each summer of his young life had been spent in that manor on the moors, having wild adventures with his cousin, Lockie, the Deadmarsh heir. This year should have been no different, but when Roger arrives, he finds everything, and everyone, changed. The grounds are unkempt, the servants long gone. Kip, the family cat, has inexplicably grown and glares at Roger as if he is trying to read the boy’s mind. Roger’s eldest cousin, Travers, always treated as a servant, now dresses like a duchess and wears round her neck a strange moonstone given to her by someone known as Master Coffyn, who has taken over the teaching of Lockie at a school in Wales called Nethermarrow. And soon after he crosses the threshold of Deadmarsh, Roger discovers that Coffyn has overtaken Lockie. The boy is deceitful, riddled with fear, and has returned bearing tales of creatures called Jagged Ones that claim to be of the Fey and can somehow conceal themselves while standing in the full light of the moon. What they want with Lockie, Roger cannot fathom, until the horror within his cousin lashes out, and it becomes savagely clear that these Jagged Ones and the Dark Wreaker they serve are not only after Lockie and Travers, but Roger, too. 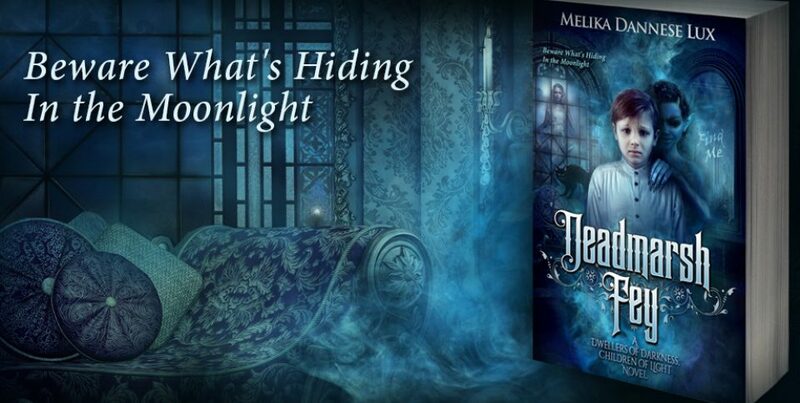 Joining forces with an ally whose true nature remains hidden, Roger seeks to unravel the tapestry of lies woven round his family’s connection to the death-haunted world of Everl’aria—and the Dark Wreaker who calls it home. The deeper Roger delves into the past, the more he begins to suspect that the tales of dark deeds done in the forest behind Deadmarsh, deeds in which village children made sacrifice to an otherworldly beast and were never seen or heard from again, are true. And if there is truth in these outlandish stories, what of the rumor that it was not an earthquake which rocked the moors surrounding Deadmarsh sixteen years ago, but a winged nightmare attempting to break free of its underground prison? Enlisting the aid of a monster equipped with enough inborn firepower to blast his enemies into oblivion might be as suicidal as Roger’s friends insist, yet the boy knows he needs all the help he can get if there is to be any hope of defeating not only the Dark Wreaker and his servants, but an unholy trinity known as the Bear, the Wolf, and the Curse That Walks The Earth. And then there is the foe named Blood Wood, who might be the deadliest of them all. It’s been a while since I last posted any updates, but today, I am happy to share with you a new and very in-depth (possibly my most in-depth one to date) interview. Many thanks to author Sonya M. Black for providing me with such insightful questions. I hope you enjoy reading not only my thoughts on writing and other subjects, but also learning more about a few special books that have impacted my life in very different ways. Maybe you’ll be inspired to invite them into your lives and let them work their magic on you, as well. A dragon lands in front of your Main Character, what would they do? It just so happens that my main character in Deadmarsh Fey, Roger Knightley, is obsessed with dragons, and has been since he was practically out of the womb, cutting his teeth on his mother’s fanciful stories about them, blazing through the Mabinogion by the time he was six, and venturing onward to further fill his head with even more fantastic legends, his favorite being the one about Merlin and Vortigern and the fortress that had been toppled again and again by the red and white dragons battling in a pool beneath its foundations. Given all of that, if a flesh and blood dragon landed in front of him, Roger wouldn’t scream or scarper away in fright, but would rather shriek in delight and run forward to hug one of the dragon’s foreclaws, then try to convince the beast to fly him back to Wraxhall, Roger’s boarding school, to equalize the playing field, as it were, by teaching his headmaster a lesson—turning Master Crisp into Master Ash…literally. But once Roger came to his senses, he would do all in his power to enlist the dragon as an ally against the Dark Wreaker of Everl’aria, and the curse this fell being has laid upon Roger’s family. You’ll have to read Deadmarsh Fey to find out if any of this really does happen in the book, or if I’m just letting my imagination rocket upward like a dragon soaring through the night sky, its black wings blotting out the light of the moon. What literary pilgrimages have you gone on? It’s not the main focus of my upcoming trip to England, but when I’m there, we’ll be spending a day in Oxford, walking in the footsteps of two authors who have had a significant impact not only on my writing, but upon my life, as well—J. R. R. Tolkien and C. S. Lewis. I expect to be awed the entire time I’m there, and quite emotional, too. Oh, and a visit to the Eagle and Child is also on the agenda! 6,900 pictures of the snug where the Inklings used to meet will be taken, so as not to miss a single angle, of course. I can’t wait! I’m sure other books got to me before this one did, but the first book I can remember which made me cry was The Turn of the Screw—and that was because it horrified me, my tears bursting forth at the very end when Miles screams, “Peter Quint, you devil!” I didn’t appreciate the ambiguity and brilliance of that line till many years later, so as a child of eight, my reaction was sheer terror. And yet I loved that little novel! I even owned a Classic comic book type edition of it that I read so often the spine broke. It’s my favorite “ghost” story of all time, and a masterful psychological study that I do not think any film adaptation has done justice to yet, although The Innocents comes close to capturing the unsettling “otherness” of Miles and Flora, and the paranoia (or does she have just cause to fear?) of the Governess. But the first book that truly touched something deep within my heart and made me not only cry, but bawl, was David Copperfield, which I read at the age of twelve. It didn’t matter that one hundred and forty years separated me from David’s world. I identified with him, was outraged by every injustice he suffered—especially the betrayal of those he’d considered close friends—rejoiced with him when he succeeded, and felt like I was living his life alongside him as I devoured the pages of that book. Till this day, I find myself smiling when I remember Aunt Betsy screeching, “Donkeeees!” or how Mr. Micawber was always sure something would turn up. But don’t get me started on Uriah Heep. I have no fond memories of him! Looking back, I see how the cruelty David endured at the hands of Mr. Murdstone stayed with me and inspired some of Master Coffyn’s qualities in Deadmarsh Fey, especially his penchant for harsh and often violent discipline against children. And now that I think of it, that fey quality of Miles and Flora so hauntingly delineated in The Turn of the Screw found its way into Deadmarsh, too, coloring certain aspects of Lockie’s character, so even though both books made me cry for very different reasons, they both impacted my writing in their own unique ways. Did you ever consider writing under a pseudonym? No, never. I’ve always wanted to be known as the author of my novels, not because I have a thirst for fame—I prefer the focus to be on my stories, not me—but because I worked hard on them. The funny thing is, though, that many readers have thought Melika Dannese Lux is a pseudonym, but I can assure you that’s exactly the name printed on my birth certificate. Do you try more to be original or to deliver to readers what they want? I think what readers want is originality. We can all be inspired by the fantasy greats, of course, and I freely admit that Tolkien and Lewis are my literary “fathers,” but to be derivative to the point of copying them is not something I’ve ever wanted to do. I’m a little fanatical when it comes to being original, so much so that when I created the name of my main villain and Otherworld in Deadmarsh Fey, I typed both into Google and Amazon to make certain they hadn’t been used before! I understand that, according to conventional wisdom, you should compare your works to those of other fantasy authors to hook readers, or even get an agent. But that’s the problem with conventional wisdom—it’s conventional, stultifying, and only interested in preserving the status quo, leaving no room for the unexpected, and very dismissive of that which it does not understand or cannot fit into a neatly designed mold. Why can’t a fantasy book stand on its own without having to be compared to anything that’s come before? Isn’t that what people really want, to read something unlike anything they’ve ever read? To get lost in a world they can discover and explore for themselves, make their home in, without being encumbered by any preconceived notions? That would be a wondrous thing, I think, and much more gratifying than reading yet another Game of Thrones clone. How do you balance making demands on the reader with taking care of the reader? The philosopher Nicholas Malebranche once said, “Attentiveness is the natural prayer of the soul.” Laziness of mind is bad enough, but having an unengaged soul makes attentiveness, and really anything else, impossible. This is why I don’t believe asking my readers to fully invest themselves—mind, heart, and soul—into Deadmarsh Fey is being unduly demanding, since I invested my entire being into writing this book. As the author, I see myself as the facilitator, and it is my job, through my storyweaving, to remind my readers that it is incumbent upon them to take care of themselves. I won’t spoon feed you, neither will I string you along, but you should know at the outset that I will not be your Virgil, guiding you through the darkling night. I want my readers to discover things for themselves in this world I have offered to them, a world in which they can lose themselves entirely—a world it is my greatest hope they will make their own. And to achieve this, attentiveness—concentration—is a must, not because Deadmarsh Fey is some labyrinth you need Ariadne’s Thread to find your way out of, but because giving not only my book, but any book, a cursory reading shows not only a lack of respect for the author, but for the reader’s own self, as well. How can you be moved, touched, inspired, if your only objective is to race through a book to finish it as fast as you can? What chance is there for you to experience wonder if you don’t let the story absorb you, if you cut yourself off from allowing the tale to strike a chord in your soul and make your spirit take flight? The opportunity to connect with something beyond you has been neglected, the moment for discovery, expanding your imagination, and knowing yourself deeper, lost when your overriding ambition is how many pages you can read in a day to reach a quota for the year, or some other such arbitrary marker that robs you of the chance to be seized by wonder. It makes the act of reading no act at all, but a passive disengagement that seems completely pointless—and dreadfully hollow. With every book I have written, but never more so than with Deadmarsh Fey, my goal has been that my readers become active participants in the experience. If this happens, I believe they will feel as if they are sharing in the recreation of the novel and will be able to capture the essence, the atmosphere, in which the work was first written. By becoming a part of the story, they are truly making it into something new and theirs, which is what I want most of all. I want them to lose themselves in a tale that seems fantastical at first, but the deeper they read, the more engaged they become, they realize that the truths in this book mirror the truths in their own lives, that these characters are not so unlike them, and that they, the readers, will miss these kindred souls after the final page is turned. When total immersion occurs, my readers will see Roger and the other characters not as I do, no longer as I’ve described them, but through their own eyes, the images I’ve created meeting the images my words have birthed in their minds, catching fire, and taking flight, burning like a phoenix across their imaginations and hopefully inspiring them to create unexplored worlds of their own, or at least to never be the same after reading this book because it has touched them in some deep and meaningful way and possibly revealed to them their true “home.” That is my wish for everyone who reads Deadmarsh Fey—that they will be open to receiving what the book has in mind for them, and be changed for the better once their journey with my characters comes to an end. Do you view writing as a kind of spiritual practice? When you invent something out of nothing, you are, in a sense, sharing in the act of creation. I’m not trying to be blasphemous or presumptuous by saying that, but I truly feel, and have done so for many years, that writing is as close as I come to touching the divine, to brushing up against the world that shimmers just beyond our own. My beloved says that all true art is a spiritual practice, and I agree with him wholeheartedly, as I do with his christening my work dream-sagas, for that is where my original inspiration for Dwellers of Darkness, Children of Light came from—in the chaos of a dream that quite frankly was almost a nightmare, a vision of two young girls, sisters, cowering at the end of a corridor in a small cottage on an fog-encircled island, flattening themselves against the wall and scarcely breathing for fear any sound would alert the gargantuan demonic bear snuffling down the hallway, growing ever nearer, to their presence—the bear that was hungering for their blood. In many ways, I also view writing as a prayer, a reaching up toward my higher self, my angel, if you will, the self I am meant to be but have been separated from here in my exile upon this earth. It’s a constant striving to make sense out of the thoughts in my head, the inspirations, the “why” of life, and to weave them into a tapestry of light and shadow, of good and evil and the grey areas in between where heroes may doubt their valor but choose to fight on nonetheless, often against seemingly insurmountable odds, because they are dedicated to saving that which they hold dear, their world, the people they love and are willing to lay down their lives to defend. That call to fight for something greater than yourself is also very spiritual at its core, and was a vital thread I wove into the fabric of Deadmarsh Fey in ways I had never done with any other book I had written before. In this novel, in this Otherworld, I feel as though I truly am writing what I dream, both literally and in a deeper sense. I have now found my “home,” at least where writing is concerned, the place where I have finally been able to fulfill the maxim that changed my life many years ago: “All we have to decide is what to do with the time that is given us.” Sixteen years old, was I, when Gandalf’s wisdom pierced my heart and set me on this trajectory. The journey has been hard, frustrating, and often incredibly lonely, but it has brought me joy, too, never more so than now, and I would not trade the experience for anything in the world, nor, if given the chance to go back and choose differently, would I diverge from this path that was presented to me. I believe in my soul that despite all the obstacles, it was the path I was destined to take…and how things were always meant to be. I also think that there is something intensely, almost ecstatically, spiritual about being seized by a story, which happened to me when writing Deadmarsh Fey. From a certain point onward, I was no longer in control of this book. My characters quickly and not too subtly disabused me of the notion that I knew what was best, and since I really had no choice in the matter, I let them take over, and Deadmarsh Fey became a much better tale because I got out of my own way. And that is something I would encourage every writer to do, whether you believe our craft is a spiritual practice or not…let your ego go. It is your worst enemy, will shut you down, choke your creativity. You must diminish for inspiration to increase, and only when you do this will your story have the potential to take wing, blaze across the heavens, and transform into something unique and rapturous. Something you and you alone were born to write. Do you read your book reviews? How do you deal with bad or good ones? Yes, I do read them. No author likes to receive bad reviews, and at one time, they had a powerfully negative effect on me, but as I’ve gotten older, and grown as a writer, they don’t influence me anymore. I know the value of my work, and nobody’s negative opinion is going to make me doubt it or love it any less, especially people who abandon my book after only reading a fraction of it. Additionally, if somebody is just spewing vitriol, I don’t take it to heart. And if they completely miss the point of the book, I don’t internalize that, either. I do appreciate good reviews, of course, especially when the reader invests him- or herself into the world I have created—living through my characters, even becoming them for the short while they are in their company—and therefore is able to truly comprehend what I am trying to say instead of simply glossing over details that were not included as filler, words that weren’t written to pad the pages, just to get things over with for whatever reason, as I mentioned above. It’s a very rewarding feeling when a reader “gets” my work, as happened recently with the wonderful Dianne Bylo at Tome Tender. Her review has become my favorite, and the best, of any of my books thus far, not only because it was erudite and well-written, but also because it revealed that Dianne had let herself be seized by Deadmarsh Fey and thereby connected with it in a profound way, which is what I hope the experience will be for everyone who reads this book. Do you hide any secrets in your books that only a few people will find? I do, but when it came to Deadmarsh Fey, everything that I hid within its pages was built up and eventually revealed in a rather shocking manner a few chapters from the end of the novel. Even at the eleventh hour—and by that I mean some of the very last scenes of the book—I was still unraveling secrets I had woven throughout the story from the beginning. Nearly all of them found resolution in Deadmarsh Fey, though I did leave a few open ended enough to be explored further in the three successive novels in Dwellers of Darkness, Children of Light. Each one of these secrets, every arc that was created in Deadmarsh Fey to be spooled out into the other books, however, did have a suitable ending when its furtherance of the plot in this tale had served its purpose. This was a conscious choice, because I despise loose ends, and even though I think that in some cases it is fine to be ambiguous—as with The Turn of the Screw—I believe that ambiguity for its own sake, or as an attempt to be “edgy,” ruins the integrity of a story. In the sequel to Deadmarsh Fey, which I’m working on now, there is a sort of inside joke for most of the novel, but it is revealed at precisely the moment when it counts most and is quite earthshattering. And yet…when readers get to that point, I have a sense they will most likely feel that if they’d just thought about it a bit more, they would have been able to solve this riddle fairly early on. I’m hoping the reaction will include a fist to the forehead and a dramatic exclamation of, “Good gad! How could I have been so blind? !” I’m incredibly eager to interweave this plot point throughout the novel—palming the ace where I can, scattering false clues, then finally lowering the boom and blowing the lid off this secret when the time is right. I confess to taking a little enjoyment in being tricksy like this when crafting my books. All right, it’s more than a little. It’s a LOT! But it makes things tremendously exciting for me, and I hope this excitement will transfer to everyone who reads my novels, this one especially. What is your favorite childhood book? The Ivy Cottage by E. J. Taylor. Even though it was very short, and I first read it at the age of four, I still remember the feeling of warmth with which this book enveloped me—as cozy as a sheltering blanket, as soothing as a mug of hot chocolate enjoyed by a roaring fire. The illustrations were entrancing, and I was completely captivated by the idea of living in a cottage in the woods, or one just on the borders of it. After all these years, this is still my dream. I’m so happy to be back at The Fantasy Hive this week, but instead of an interview, one of my most favorite excerpts from Deadmarsh Fey is being featured! Thanks once again go to Laura and the great people at this fantastic site for allowing me to showcase my work. I hope this excerpt will intrigue and unsettle you, and make you insatiably curious to find out what happens to Roger next! That last one shouldn’t have made the list, you say? Try telling that to Roger Knightley, then, for it is exactly what he stumbled upon while sojourning in the woods behind Deadmarsh. Here, on this whimsical table, were found treats stuffed to bursting with enough luscious flavors to satisfy the cravings of a boy possessed of a sweet tooth the size of the North York Moors. How could he resist such a temptation? I feel safe in saying most anyone would find it difficult to do so…assuming you could actually seewhat had been set out to entice you. Forgot to mention that small detail. The feast is invisible, unless you look at it through a glass darkly, which, for Roger, means peering through the two halves of a cracked, milky blue moonstone known as The Eye of Arianrhod. Without this, there’d be no hope of piercing the glamour that hangs over such a fey place. But is it a glamour of enchantment? Featured Interview at The Fantasy Hive!